Meatballs are quite possibly my favorite food. They’re at least one of my top 5, and when someone asks me they are usually the first food to come to mind. My mom has always made meatballs in the slow cooker , so that’s almost always the only way I make them as well. The meatballs stay really moist and tender and the sauce soaks up a lot of the meaty flavor when cooking all day. 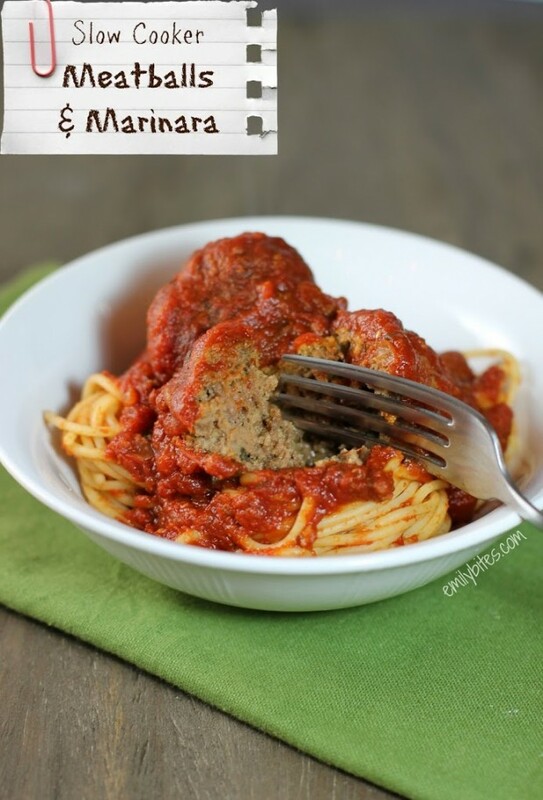 This Slow Cooker Meatballs & Marinara recipe is a great one to prep in the morning and come home to after work, or to cook overnight and then reheat for dinner. The meatballs are delicious served over pasta, on rolls as meatball subs/sandwiches or just on their own as a meaty, saucy main course. I decided to make my own marinara to slow cook the meatballs in and I’m so excited about how delicious it turned out. I’ve been getting more confident in creating my own sauces and just taste testing until they seem right. This one is tangy and tomato-y and takes on a rich, meaty flavor from the meatballs. Usually when I make these meatballs I just dump some store bought sauce in with them (which is why I hadn’t blogged about them up until now), but this sauce was so easy to throw together and so delicious I will definitely make this one from now on. I’m so glad I finally took the plunge and put together a sauce so that I could share these with you – they’re my favorite! In a large bowl, combine the bread crumbs, Parmesan, a tablespoon of the Italian seasoning, garlic powder, eggs and milk and stir until well combined. Add the ground beef mix together with a spoon or your hands until thoroughly combined. Separate the meat mixture into 16 even pieces and roll each into a ball. Mist a large pot (or the pot/insert of your slow cooker if it is made for stove top use – this is the slow cooker I use) with cooking spray and bring over medium heat. Place the prepared meatballs in the pot and brown the outsides (about 2 minutes on each side). Do not cook through. When the outsides are browned transfer the meatballs to your slow cooker. In a medium skillet, bring the teaspoon of olive oil over medium heat. Add the diced onion and cook for 4-5 minutes until the onions are translucent and a bit golden. Add the minced garlic and cook for another minute until fragrant. Transfer the onion & garlic to a large mixing bowl. Add the crushed tomatoes, tomato sauce, tomato paste, basil, 2 teaspoons of Italian seasoning, salt, sugar and the bay leaf to the onions and garlic in the bowl. Stir to combine and then pour over the meatballs in your slow cooker. Stir to cover/coat the meatballs. Cook meatballs on low for around 8 hours. Remove the bay leaf before serving. These sound yummy. My mom always used fresh Parmesan and froze the rinds when they were grated down. When she made sauce/gravy she would toss the rind into the sauce to add depth and flavor. Never made meatballs in crockpot but I look forward to trying this one next weekend! Thanks Emily! Sounds yummy, I love parmesan. Hope you love this! This sounds delicious! Your sauce recipe is very similar to mine! I’ve never thought to put sugar in the sauce- I’ll have to try that! What is the serving portion for the pasta? Pasta is not included in the recipe but if you’re asking how much is pictured in my photos it is 1 cup. These meatballs were delicious!! Thank you for a great recipe. I am a huge fan of your blog and have made several of your recipes and have loved every one of them. Oh my Emily you’ve outdone yourself! These were so good 🙂 And the hubs and I both loved the meatballs. Thank you! Do you think it would be ok if you don’t pre-cook anything and just put it all in the slow cooker raw? I’ve never done it that way, but you can certainly try it! Can’t wait to try this! I do have a couple questions. Could I make the meatballs the night before (brown them), refrigerate overnight, then put them in the crock-pot the next day? If I choose to use store bought sauce (I know, hanging my head in shame), how many jars would I need? Love your blog! Has anyone tried 4 hours on high? Wanted to make these for today and don’t have 8 hours. I made this yesterday and was short on time. I cooked it on low for 90 minutes to get it up to temperature and then high for 90 minutes and then low for 3 hours and it was perfect. My husband and I really liked it a lot. Hi! When you list “can tomato sauce” what exactly do you mean? I’m from the UK so this might be an ingredient I can’t get. I’m from UK but live is USA now and have discovered its passata! ok, I’m not gonna lie. This is AMAZING!!!!! Honestly, it’s the best spaghetti and meatballs I’ve ever made in my life. The servings are a great size…VERY filling. I didn’t cook the meatballs before putting them in and cooked it on high for 8 hours. By the time I got home, my slow cooker was on warming (still very hot) for a couple of hours as well. Regardless, this was just awesome. Definitely something that’s going in to my regular meal repertoire. Thanks! You rock, Emily! These were awesome — I’ve always had trouble getting my meatballs to taste like I want them too but this method worked! A couple of changes I made were to use 99% extra lean turkey instead of the beef, subbed oatmeal for the breadcrumbs and I didn’t brown up the onion and garlic first. In fact, I just used minced onion instead of a regular onion because my kids will pick the onion out of the sauce. I combined all the sauce ingredients into the crockpot, made the meatballs (although browning them was a bit of a pain – I might try skipping that step next time) and then added the meatballs in. I was also short on time so I just cooked it 4 hours on high. So delicious! Thank you for all your work that you put into your recipes; the flavor of everything is always so delicious and I know I can count on them for reliability. Oh and because I’m an obsessive calorie counter, the calories for my version (same serving size) is 165 (4PP for WW) value a serving. Ok back with an update because I couldn’t wait even a week to make them again. I did not brown the meatballs first this time and they still came out great! Woo-hoo! We tried this last night, I don’t usually add bread crumbs to my meatballs, as I hate when they get soggy. I went ahead and trusted your judgement 🙂 and they were a hit. My husband had the left overs this morning. Oh-so-good! Thank you for all that you do! OMG this recipe is delicious! I can my own tomatoes and needed a good recipe to use them and those meatballs……scrumptious! MMMMMMMM Thank you, Thank you, Thank you!!!! I’m trying this recipe first thing in the morning will write another or should I say update tomorrow evening.. This sounds so yummy!! I am also going to serve this in sub rolls and with fresh mozzarella cheese.So EXCITED..until tomorrow.. I hope you loved it!! How many meatballs in 1 serving? 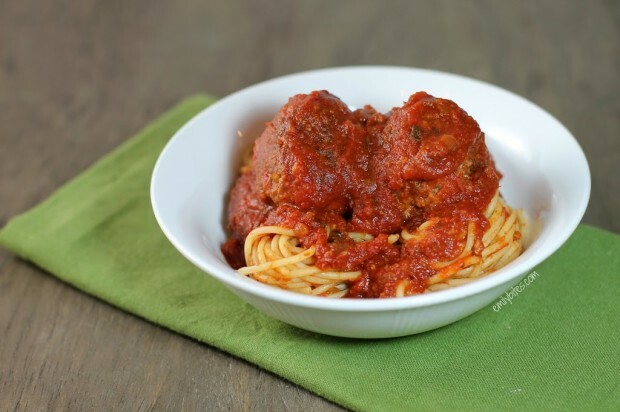 I made this yesterday and I have to say this is the best spaghetti and meatballs recipe I have ever tried……and I have tried MANY. I have tried crockpot versions, completely from scratch versions with fresh tomatoes and pretty much any kind of sauce you can try. Nothing compares to this recipe….and I come from an Italian family. This recipe reminded me of my grandma’s sauce. I have been on a quest to find my perfect sauce and I think I have a winner! You have done it again! Thanks! This comment made my whole week! I’m so thrilled that this recipe was such a hit for you and I’m honored that you compared it to your grandma’s sauce. Thanks so much for taking the time to tell me you loved it! This sounds great and I’m back at the school schedule and looking for lower fat slow cooker meals. I bought some turkey meatballs a while back and want to use them up. Do you think I could substitute those? I usually make my own…but am short on time! Thanks! I’ve made frozen meatballs in the slow cooker before (using different sauce) and it worked fine, so I don’t see why not. I can’t remember how long it took, so you may want to adjust the time. Hope you like the sauce! If you don’t have fresh basil, how much dried would you put in? Hi Emily! I’m going to make this today, I just want to let you know how amazing your recipes are. I was wondering how many SP A cup of the marinara would be. We love our sauces and 1/3 c just wouldn’t do it for us! Thanks! I can stop looking for the perfect meatball recipe because this is it! The meatballs were perfectly seasoned and very not hard as a rock like my previous meatballs have been, almost fluffy. The one thing I did different was use my instant pot instead of my slow cooker. 5 minutes on high and they came out awesome!! I tried browning the first batch but they stuck to the bottom of the Instant Pot and there’s no reason to dirty additional pots and pans so I threw the second batch right into the sauce. They cam out great! I’m so happy you loved them, Marian! Great to know they work well in the instant pot as well, thanks for letting me know! Had a spaghetti and meatball craving last week and trying my best to cut down gluten as I think I may be intolerant and also trying to lose weight….she used oats instead of bread crumbs and they were great but I will have to try you recipe next time…we used a quinoa pasta which was yum! This was incredible! I made a double batch of sauce but tripled the meatballs, using 2 parts extra lean ground beef, one part lean ground pork and one part ground turkey. My family and friends all adored it. And I love that I could put it all in 2 slow cookers and leave my house for the day. Thank you so much for sharing. This is a ‘go to” recipe for me! I double the sauce and add Italian sausage cut into 2 inch chunks and add raw with the raw meatballs to the sauce. I find cooking the meat raw in the sauce is not only easier but it tastes better. It is a great make ahead and I am taking it to our friends cabin for an easy make ahead meal for the weekend. I know they will love it. Emily, this is an excellent recipe. One thing I’ve learned through trial and error is add the tomato paste to the onion and garlic mixture and let it cook for 1-2 minutes it really adds so much more flavor to the sauce. Just be careful and give it a couple stirs so that it doesn’t burn. Then follow your recipe as written. Thanks for all of your wondeful recipes. I’ll have to give that a try! Thanks Jeanne!